A very classic old hotel here, meaning an elegant redbrick Victorian townhouse, a friendly welcome, and some stately, old-fashioned decoration in the public areas. 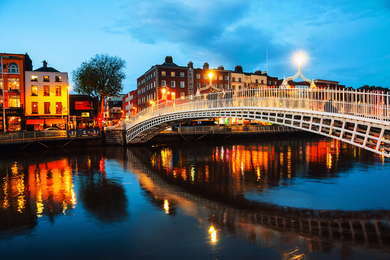 It's located just between the edge of Ballsbridge and the city center, very close to the Aviva stadium, and around a 25-minute walk into town (or buses stop right outside the hotel). There's parking too. The hotel corridors can feel a little like a rabbit warren because of the building's heritage, but that's all part of the charm. One thing to note for sauna fans: some rooms, unusually, boast their own. YOU SHOULD KNOW The entrance to the hotel at the front is up a flight of stairs, and this combined with the building's age make it tricky for wheelchair users (although there is a lift). Rooms come in single, double and triple incarnations, and the hotel also operates some townhouses sleeping 6-8 guests for bigger groups. All are quiet and cosy, if not remarkable. Beds are comfortable and rooms are individually decorated, with thick, often richly colored curtains, and clean, crisp sheets. Some have stained glass or other historic features. Almost all rooms have bathtubs with jacuzzi jets or saunas, which is an eccentric but pleasing touch. The slight downer of this is that not all of the rooms really had the space for a sauna, but there's a trade-off there that we'll leave to you - space or sauna. The lobby is more of a small, old-fashioned reception corner, staffed by cheerful and competent staff. If the hotel feels like a family home, that's because it is: owners Mr and Mrs Killoran have lived there since 1982. Breakfast is tasty and comprehensive, including both continental and full Irish options, although check it is included when you book. There's no bar as such, but the guest lounge is very pleasant, complete with a roaring fire in a marble fireplace and lots of cosy grey sofas. There are books and tourist leaflets available, and guests can enjoy hot drinks and a wee nip of something alcoholic there, too. The hotel is just on the edge of the city center in leafy Ballsbridge, meaning it is quiet and relaxing but not too far from the action. The bus stops outside the hotel are a bonus, too. And it's great for the Aviva stadium. The Chophouse (4-minute walk) is an airy, buzzy gastropub that does a mean Sunday lunch nice and close to the hotel. Or The Bloom Brasserie (10-minute walk) offers a stylish take on the traditional brasserie, with good-tasting classics dished up by friendly staff. You can't beat the attractive Bath Pub (6-minute walk) for atmosphere on match days at the Aviva stadium, and it's a pretty good bet for craft beers and good grub the rest of the time, too. Or treat yourself to cocktails at The Vintage Cocktail Club (18-minute bus, 28-minute walk/stumble) in Temple Bar, a classy affair. Showing the world that doing a hotel the old-fashioned way, with a focus on comfort and a relaxing night's sleep, is not boring, the Roxford is a stately old dame of the Irish hotel scene that's keenly priced and definitely worth a look if you prefer being on the edge of the action rather than right in it. Oh, and your room might have a sauna in it. Of course.